I have done all this , but i still don't know if we are bonded. The problem we have is once he starts running, he seems to keep running. He has never been a treatening horse . No biting or kicking , never aggressive either. I don't know wether he doesn't understand or just stubborn. Sometimes he Round pens himself. He just goes out and runs . Most times if we are in the rp with nothing on he will stay by me and move with me . If i have the saddle on he goes to running right away . Thanks for any help . We are buddies most times , but he seems nervious most times too. If I were there we would have all these problems taken care of in less than an hour. It doesn't matter if he is a green BLM horse. Some would say this horse is different and won't respond to herd dynamics techniques like domestic horses. 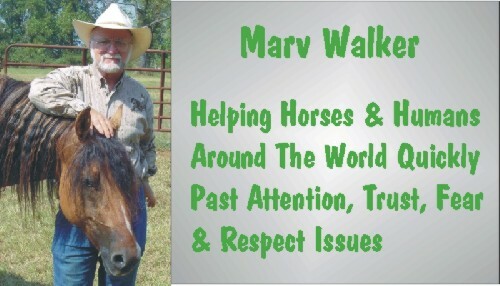 While I have actually only worked off the range horses a few times I have seen them worked numerous times in videos, documentaries and the like. He is a horse and he will respond to horse interactions just like any other horse. And because his instincts aren't as clouded by humans as domestics, he will probably respond much faster than domestics. There are things in this message that tell me this horse is pretty much compliant, just uncertain as to how to react to the human things...i.e. he will stay and move with you at times, he used to stand still while mounting and you are big buddies. These problems are really nothing, hopefully we can give you some things that will help the two of you communicate better. First of all, I don't think you have performed the bonder with him. I think you have the bonder I sent confused with round penning. I say that based on the fact that you say the horse "seems to keep running" and "sometimes he round pens himself". Not if the bonder is performed properly he doesn't. The thing to do now is to read and reread the bonder. Get the concepts and the sequence down pat in your mind. Memorize the signals that show the transitions between the stages. Study the explanations for controlling the horse's movements and directions. The only connection the bonder has with traditional round penning is that a round pen is used. The bonder is a procedure of control. That control brings about a mental change in the horse that causes the horse to seek and become part of a herd situation. Lacking an actual herd, the horse will accept and become part of a herd simulation. At that point there should be no doubt he's bonded to you. In performing the bonder, you MUST take control of the pen. When you control the pen, you control the horse. If you are unable to control the horse from the center of the pen, which is the ideal control point for the ENTIRE pen, you have to take control of a slice of the pen and then build to the whole. If you are in the middle of the pen and he's racing around you like a nut and you cannot control him turn and quickly move to the opposite edge of the pen from him. He should turn and go back when he sees you but don't try to stand directly in front of him because you never really know if he will. That should stop his going around. If you maintain your position at your slice he will eventually stop as far from you as possible. That will be at the opposite side of the RP. Then if you want him to go to the right, you move to the left and as soon as he starts off, move to the center. When you want to stop or change his direction do what you have to do to stop him from going completely around. That is how you change his direction when *YOU* want to. One you have performed the bonder and he is beside you, pick up the problem foot. If he leaves send him around a couple times in each direction then allow him to come back and then pick it up again. After a couple times he should allow you to lift it at will. Same with the saddling. If he leaves with the saddle, forget he's wearing it and do the same thing you did with the foot. Send him out a couple times both ways and let him come back. In fact, *if* you wanted to, you could run him through the bonder while he's saddled, I often do. A very helpful exercise is to "act" like you're going to mount. Don't give him any predictable actions. Lift your foot to the stirrup, take it away. Get halfway up, get off. Get on, get off. Get on for a minute and just sit there get off. Vary what you do. Get him to the point where he has no idea what will happen next and he waits because he doesn't know what's next. Once he gets in the habit of waiting you can dispense with the variety and just get on. You also say he takes off at a trot when you mount. If you can, just sit there and let him trot. While he's trotting, use that as rein training time. When you turn him, just hold the rein until he gives into it and when he does, release it. You can steer him straight at the fence so that when he gets to the fence he'll either stop or turn. If you can sense which he is going to do, give the cues for stopping or turning. Another great exercise is to just sit on the horse and let him do what he wants to do without any urging of any kind from you. Just relax up there while he dwaddles, moseys or just stands. This will teach him that your presence on his back does not always mean go. As I said earlier, I'm almost certain you haven't performed the bonder I sent with this horse in the manner it is laid out. And that is crucial. Study it over a few times and give it another shot. You'll be amazed at the difference it makes. For a free copy of the "Bonder" email Click here.